I Never Understood The Title Of These Books. Being Informed Means You Are NOT A Dummy. For those of you who would like to know the most recent status of the Prive construction on the second Island, I thought I would try to give you a layperson’s explanation of where we are after sitting through the hearing on Friday, October 23, 2015. When we started this lawsuit, we asked the Court to look at the evidence and determine two things. First was whether the Vested Rights Agreement (“VRDA”) offered by the City Manager of Aventura in 1999 (but not signed and made public until 2006, nor ever voted on by the City Commissioners) was valid or enforceable. Second was even assuming the VRDA was valid, whether the agreement itself let Cohen build anything other than single family homes. The way a lawsuit like this works is that the parties gather evidence to present at a trial. The purpose of a trial is to determine the facts of a case – who said or did what, who is telling the truth, etc. – and once a set of facts are determined to be the true or correct ones, the law is applied to reach an outcome. A good example is a traffic collision between two cars. Each driver says the other ran he red light. A judge or a jury listens to the two drivers and any other evidence and decides who is telling the truth. Since the law says the driver with the red light is usually at fault, whoever the judge or jury decides has the green light wins, and the one with the red light loses. In between the filing of a lawsuit and the trial, the lawyers can take shortcuts. One of those shortcuts is a motion for summary judgment (“SJ” or “MSJ”). This is where one side says to the judge that everybody on both sides agrees with the facts, or that the different versions of facts do not matter, so the judge can apply the law and declare a winner. When it comes to land use planning, a City or County creates certain districts that say where different types of buildings can be built. In 1976, the owner of Two Islands (a Trust now controlled by Gary Cohen) won a decision against Miami-Dade County to change the zoning of the Two Islands from general development to mid-rise, mid-density apartments. First of all, the Court does find that WIPOA has standing to bring this particular action, so the motion for summary judgment as to the standing issue is denied. As it relates to the issue of the vested interest right, what the Court — at this time, as it relates to the vested right of Mr. Cohen, the trustee, the Court, first of all, grants the motion — renewed motion for summary judgment in part. There is no question in this Court’s mind that Mr. Cohen, as the trustee, has a vested right. Further, though, the issue for the Court is whether or not that vested right extends to building beyond the intended purpose, that the single family homes to the condominium units. That’s where the Court believes that there is a genuine issue of material fact, as to whether or not the rights are vested to extend beyond the original intended purpose. So in that regard, I deny the motion for final summary judgment. So five months ago the Judge actually said two things: Williams Island has the right to challenge Cohen, and the question still remains whether Cohen is limited to building single family homes on the North Island. On October 23, 2015, Judge Bagley heard more motions. One was filed by Cohen again asking for summary judgment for three reasons. This time Cohen’s motion was based on the premise that since the Judge said Cohen had vested rights that means he can build a high rise. Cohen also asked the Court to say Williams Island and Island Estates did not have standing to sue because of a decision in a federal case. And finally, both Cohen and the City of Aventura argued that Williams Island and Island Estates filed their cases too late and were prevented from suing by the Statute of Limitations. Again, the Court ruled the Cohen’s motion should be granted in part – as he did the last time – because Cohen has a vested right. Judge Bagley then denied the rest of that part of the motion for the same reason as before (whether the rights allow him to build something other than single family homes) but went even further. Judge Bagley said there were serious question about whether Cohen was estopped from building apartments or condos because of the things he said to the City and County, as well as the residents of Island Estates; whether the Agreement with the City was enforceable; and whether the City officials failed to follow the law and their own rules, thereby impairing public participation in land use decision-making. Why do we see the Prive under construction? 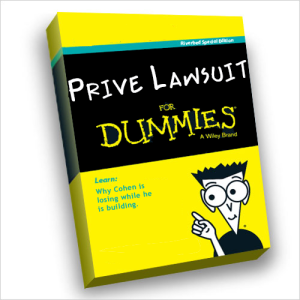 Cohen and Prive are building at their own risk. If they lose the case, they will surely argue to the judge that it would be wasteful for the Court to order them to take down the building. If you don’t feel that this would happen, I am going to suggest you talk to the developer in Pinecrest Lakes who was ordered to tear down five completed and three under construction apartment buildings because the judge (and appellate judges) said he went ahead and spent millions to build during litigation at his own risk – the developer assumed he would win, but since he lost, he couldn’t say it wouldn’t be fair to make him demolish the project. November 19th: Island Estates motion for summary judgment regarding easement agreements. This will involve whether the future residents of the North Island – if they are condominium residents – can use the private road and bridges of Island Estates. January 19th: This is a specially set date for the start of trial for the non-vested rights/Island Estates part of the case. These are matters related to Cohen’s failure to turn over control of, and transfer property to, the HOA. January 29th: he Court will hear Williams Island’s motions for summary judgment on Cohen’s counterclaim against Williams Island and Wilma Felder. March 7th: This is a specially set date for the start of trial on vested rights to make a final determine whether Cohen can build anything other than single family homes. This entry was posted on October 26, 2015 at 3:02 PM and is filed under Articles & Commentary. You can follow any responses to this entry through the RSS 2.0 feed. So in other words, Cohen feels he is beyond the law. He skirted the point that this was still in contention and went ahead with his building. Does he own the commissioners who represent the City of Aventura? Why is the City of Aventura stating that Williams Island filed too late? Mr. Cohen sold the single family homes under false pretenses stating that the second island was slated for single family homes when he knew in 1976 that he had won a decision to change the zoning. He doesn’t seem very ethical. Great work- thank you very much.